Squalene peroxide is associated with initiation of inflammatory acne cascade, triggering cytokines and lipoxygenase pathway  . In addition squalene peroxides diminish the important skin antioxidant glutathione, while pre-treatment with glutathione depleting agents (DL-buthionine sulfoximine and dethyl maleaate) makes the comedogenic potential of squalene peroxides even worse  . Accumulation of lipid peroxide in comedones caused by oxidation of sebum is associated with progression of acne and is involved in inflammatory acne changes  . Once inflammation initiated, more generation of, reactive oxygen species, ROS is expected  . ROS and free radical oxidative damage is well recognized cause of skin aging and inexorably enhance our attention toward reinventing the way we conceive anti aging acne treatment as this inevitable process affects more individuals suffering from acne vulgaris. Presence of inflammation is evident in acne vulgaris and well-known as one of the cornerstones in pathogeneis of inflammatory acne  . However, mechanisms promoting inflammation has been less studied. Keratinocytes exposed to P. acnes increase production of reactive oxygen radicals(ROS) in particular superoxide. ROS are handled by glutathione and SOD system to produce GSH-x and finally water, which explains why SOD and GSH-Px are exhausted in acne patients  . Drugs with known comedolytic activities such as retinoic acid derivaties show significant inhibition of the p. acnes-stimulated superoxide production , IL-8 release and keratinocyte inhibition  . Blood antioxidant enzyme activities including superoxide dismutase (SOD) and gluttathione peroxidase (GSH-Px) in patients with papulopustular inflammatory acne are significantly lower than that of controls  . Low blood SOD, GSH-Px and malondialdehyde (MDA), a marker of oxidative stress, are characteristic of acne patients  . CD36 and TLR-2 recognize P.acnes. CD36 triggers the production of peroxide through NADPH oxidase pathway (NOX) and combines with NO to form peroxinitrites which, in turn, activate p38 and ERK MAPKs, thus contributing to IL-8 production. 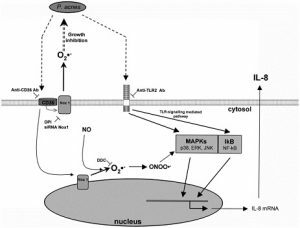 TLR-2 signaling pathway provokes IL-8 generation  . Some studies suggest therapeutic effects of antibiotics with antioxidants activity to treat inflammatory acne without exerting a bactericidal/bacteriostatic effect against acne bacteria. Minocyclin and other tetracyclines, known to have clear antioxidant activities  , at sub-antimicrobial doses, reduced papules and pustules by over 80% after 3 months in those with moderate acne  . However, growing tetracycline resistance, acquired through 16S rRNA mutation, [14-3], observed in 9.2% of skin samples in one study [14-1], and adverse effect during pregnancy, tooth discoloration in infants whose mothers took the drug during pregnancy [14-2], limits their pragmatic use in clinical practice. Another aspect of lipid peroxidation in pathogenesis of acne vulgaris is from studies which suggest association between inflammatory markers, such as IL-1, IL-17 and IL-22, and upregulation of antimicrobial proteins, such as psoriasin, calprotectin, RNase 7, and human beta defensin, hBD-2 and hBD-3  . Such a scenario has been reported for Propionibacterium acnes, an abundant skin commensal, preferring lipid-rich habitats such as sebaceous glands. P.acnes produces a lipase which is able to generate free fatty acids through degradation of skin lipids. This leads to an accumulation of free fatty acids such as oleic acid which promote skin adherence and colonization of P.acnes, hyperproliferation and inflammation  . Antioxidants has been widely used in treatment of skin disease for their protective effect against free radical species. Reactive oxygen species, notorious for their tissue injury and auto oxidative damage by attacking DNA or membrane lipids, are generated as a result of neutrophil chemotaxis and inflammatory acne reactions in response to propinibacterium.acnes colonization  . Thin layer chromatography of skin surface lipids have been demonstrated of having higher level of polar lipids, which are comedogenic by-product of squalene, a major constituent of sebum with six double bonds, high oxygen scavenging capability and high susceptibility to oxidation. Moreover, antioxidants may be potentially beneficial by preventing infiltrated neutrophils from releasing reacitve oxygen species and restraining concurrent inflammation implicated in acne . One of the most well-known antioxidants used in skin disorders is ascorbic acid  . Sodium L-ascorbyl phosphate, SAP, has been demonstrated effective in treatment of acne vulgaris  . Additionally one study indicates synergism of this compound with retinol  . Another study has been suggested that 1% sodicum ascorbyl phosphate (SAP) has a a strong antimicrobial effect with a log reduction of 5 after 8 hours on P. acnes in a time-kill study  . Further, on in a human in vivo study with 20 subjects an SAP O/W formulation significantly prevents the UVA-induced sebum oxidation up to 40%  . Another study indicates superiority of sodium L-asorbyl 2-phosphate compare to 1% clindamycin gel in treatment of acne vulgaris  . Several factors influence production of sebaceous glands but it is predominantly hormonally stimulated. Androgens especially from the testes and adrenals, stimulate the sebaceous gland directly and influence acne inflammations, whereas terminal sebocyte differentiation is assisted by peroxisome proliferator-activated receptro (PPAR) ligands  . Besides, sebaceous glands are important formation site of active androgens. L-ascorbic acid 2-phosphate has been suggested for its inhibition of DHT (dihydrotestosterone) by repressing DHT-induced DKK-1 (dickkopf-1) protein expression as examined by enzyme-linked immunoabsorbent assay (ELISA)  . Furthermore, inflammation is another primary event in acne vulgaris which may be curbed by constant delivery of vitamin C to the skin cells through topical application of magnesium ascorbyl phosphate , which explains antioxidants may counteract ROS through two principal mechanisms . Zinc ascorbates is among new suggested modalities supported by one study done in Japan. In this study zinc ascorbate has been shown to have superoxide dismutase-like activity  . Superoxide dismutase, SOD, is an enzyme that controls reactive oxygen species production. This study substantiates a role for zinc ascorbate for treatment of acne vulgaris with its antimicrobial activity especially against staph aureus and E.coli. This antimicrobial activity is significantly higher than that of either zinc or ascorbic acid alone even in a lower concentration. Zinc treatments to ethanol-intoxicated rats was able to bring down the elevated level of SOD, catalase and GPx, gluthatione peroxidase, to within normal limits  . Green tea extract, well known for its polyphenols, with about 40% catechins, has been suggested to be useful in the treatment of androgen-mediated skin disorders including acne  . Green tea exerts its effect through mechanisms, including antibacterial effect through anti-adhesive activity against P. acnes and staph aureus  . Green tea has been shown to impede local and systemic declines in SOD and GSH-Px activity whereby attenuates lipid peroxidation  . Nicotinamide, essentially an antioxidant, exerting most its effects via poly-adenosine diphosphate-ribose polymerase inhibition shows comedolytic activity  . 4% nicotinamide gel is of comparable efficacy to 1% clindamycin gel in the treatment of acne vulgaris by providing potent antiinflammatory activity without the risk of inducing bacterial resistance  . Systemic use of nicotinamide has also been shown effective after 2 months of use  . Human studies have demonstrated that lutein and zeaxanthin are present in the skin, and animal studies have provided evidence of significant efficacy against light-induced skin damage, especially the ultraviolet wavelenghts  . Topical application of lutein has been demonstrated to decrease up to 60% in lipid peroxidation and its use in evidence based skin care for maintenance of acne treatment is warranted  . lactoferrin is a milk protein with inhibitory effect on lipid peroxidation induced by oxidative stress  . Lactoferrin-enriched fermented mild ameliorates inflammatory acne with a selective decrease of triacylglycerols in skin surface lipids  . An open label study over an eight-week period demonstrated clinical efficacy of application of topical vitamin E in acne patients of mild to moderate severity. This study which was to evaluate limiting contribution of free radical oxidation through using vitamin E for acne holds a sufficient promise as an impetus for future studies.